(CSE) Faculty of Computer Science and Engineering - University of Information Science & Technology "St. Paul the Aposle"
If you are interested in the field of software engineering and programming, the faculty of Computer Science and Engineering is the right place for you. This faculty will make you an expert programmer, giving you the essential programming training by working on many software engineering and design projects. The role of CSE faculty is to incubate trans disciplinary research widely applicable across natural, social, and engineering systems. The school will lay down the foundations that will enable students to be familiar with the latest innovations in the field. Our professors and students share mathematical depth, as well as a strong commitment to engage in fundamental research that tightly couples theory and experiment. 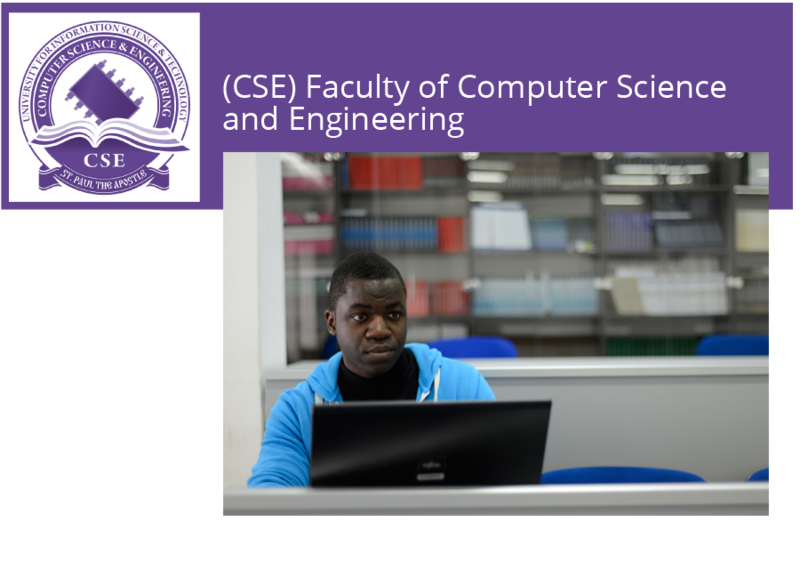 The faculty of Computer Science and Engineering will teach you everything about programming, programming concepts, programming theories, computer organization and function, and much more. The Graduate programs are designed to provide students with the theoretical foundations and advanced knowledge in analysis, collection, classification, manipulation, storage, retrieval and dissemination of information, as well as the role of information systems and technologies in both business and society. Basically, at this faculty you get all the knowledge that a professional programmer and engineer should possess. The knowledge acquired by students at the CSE faculty can be applied, not only in some aspects of computer science, but also in other fields such as archival science, cognitive science, commerce, communications, law, library science, museology, management, mathematics, philosophy, public policy, and the social sciences. For all these reasons, Computer Science professionals are at the top-list of the most paid professions in the world. By graduating from this faculty, you get a certificate in the field of Computer Science and Engineering according to the length of your chosen program. Since you will certainly be a programming expert, you will have the opportunity to work in the programming field, either as an individual programmer and researcher, or as an employee in any type of programming company. As there is a big competition between many highly qualified programmers and engineers nowadays, you should use your skills as much as possible in order to make a successful programming or engineering career. Don’t miss the chance. After successful completion of their studies in the first cycle, our students obtain a Bachelor degree in Information Science and Technology in the area of CSE. For the second cycle of studies, they obtain a Master of Science degree in Information Science and Technology. Computer Engineer, Computer Forensics, Computer Graphic Specialists, Computer Programmer, Computer Security Professional, Computer Software Engineer, Computer Systems Engineer, Computer Systems Manager, Cryptanalyst, Database Developer, Games Programmer, Computer System Administrator, IT Security Officer, Medical Informatics, Network Systems Analyst, Software Developer, Software Tester, System Analyst, Web Designer, Web Developer. After completion of 3 years of studies, with at least 180 ECTS credits, students will get a degree of Bachelor of Engineering in Computer Science and Engineering. After completion of 4 years of studies, with at least 240 ECTS credits, students will get a degree of Bachelor of Science in Computer Science and Engineering.